Fall is one my favorite seasons. It marks the end of summer and the beginning of the much anticipated cold season, especially here in California where sunny days can get overrated. If you’re Michigan, then please disregard what I just said. Here in Cali we welcome those “chilly” days when it’s finally in the low 70s and we can pull out the scarves and boots. Yes! Anything below 70 is freezing. Another thing I love about fall is the delicious bounty of fall fruits and vegetables. In our backyard, the ripening of the persimmons marks the beginning of fall. Persimmons are quite the misunderstood and strange fruit that most people will wonder about but ultimately ignore at farmers markets. They can be quite pricey and only show up in the fall. If you’re wondering, they kind of taste like honey but not as sweet. The texture of the fuyu persimmon is firm and great to eat ripe. As opposed to the hachiya persimmon, which is mushy and pulpy. Our tree is loaded with ripe fuyu persimmons by mid-November and thus begins the search of creative ways to use them. So, my search this year was made easier with Pinterest, of course. 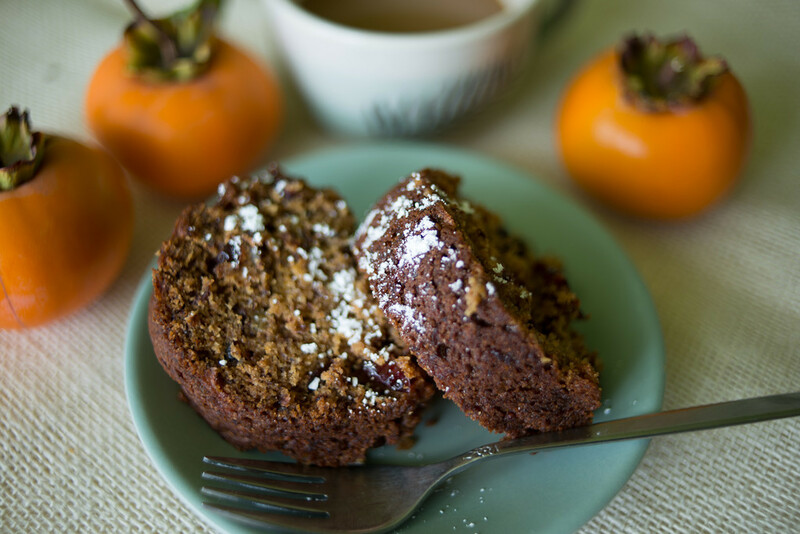 I ran into a couple of great recipes: Persimmon Bundt Cake and Persimmon Jam. I made a few adjustments to the original recipes, only due to preference. Lately I’ve been on a coconut oil kick so I used coconut oil instead of butter for the cake. The flavor of the coconut oil is very subtle but pairs surprisingly well with persimmon. I didn’t have raisins so I used cranberries, plus I added pecans instead of walnuts. I chopped what needed to be chopped in my food processor and I didn’t even bother peeling the persimmon. And because I’m not big on sweets, I only added 1 cup of maple syrup instead of the sugar that the original recipe called for. It was sweet enough for my taste buds. Enjoy! This cake is the bomb! That’s what we say here in Cali. The next thing I tried was persimmon jam. I was a bit skeptical. I had never made any type of jam before, and to be honest with you, I find the jam-making process a bit cumbersome and time consuming. But I gave it a try. The persimmons cooked in the crock pot overnight and the next morning the sweet smell of cinnamon filled the whole house. It was amazing. The smell of fall permeated my senses. The jam-making process after making the pulp takes about 1 ½ hrs. I tried to cook it down as much as possible. I cooked it over low-medium heat and sometimes on low. Only because it started bubbling like lava and I was afraid to burn myself. 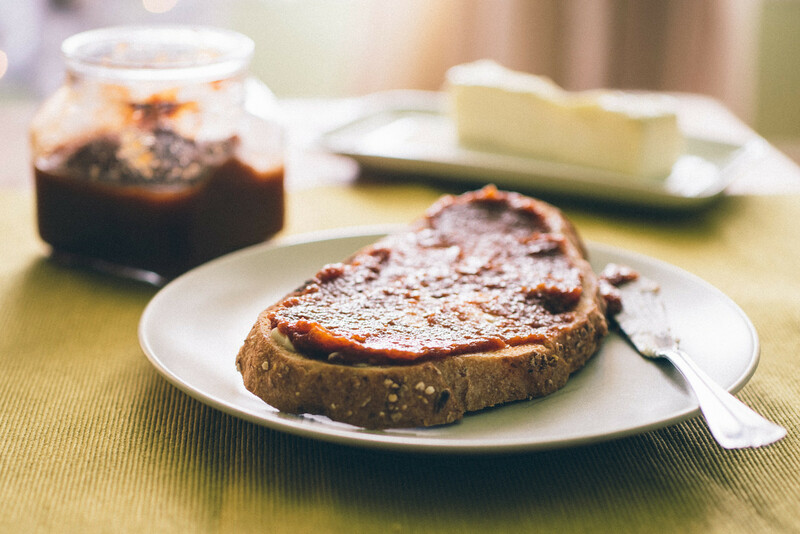 It doesn’t gel like a typical jam. It thickens up and spreads nicely though. It will last in your fridge for as long as 6 months if it was canned properly. Canning isn’t as intimidating as it sounds. There are different ways of doing it but all I did was boil the jars and the tops in a large pot. Then I poured hot jam in the hot jars, sealed them, and immediately turned them upside down. They were allowed to sit on the counter overnight before putting them in the fridge.